Wood, Frank Watson (1862-1953). Watercolour signed and dated 1927. 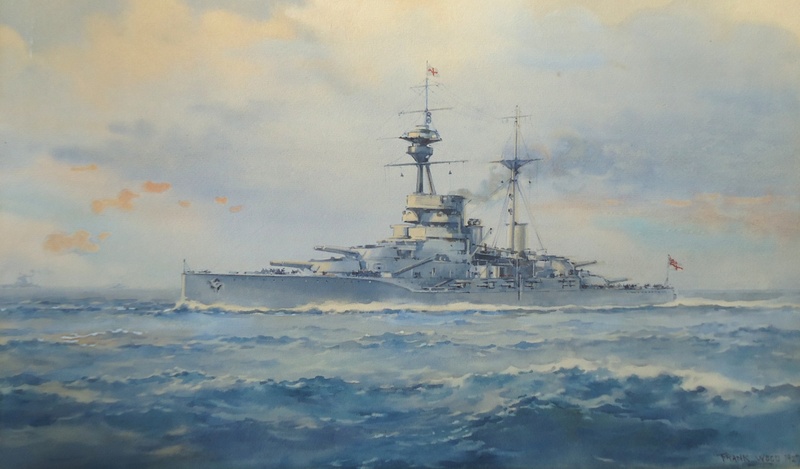 It would appear from the glimpses Frank Watson Wood gives us of a sternwalk that this is HMS REVENGE during the period 1919/20 (when the sternwalk was fitted) to August 1924, at which time her fore top gallant mast was struck altghough she continued as a flagship until 1927. She is painted here still with that top gallant and wearing the St George Cross of a full admiral, Admiral Sir John de Robeck Bt, GCB GCMG, Commander-in.Chief Atlantic Fleet August 1922 - August 1924. Was this watercolour painted merely because REVENGE had caught the artist's eye or was he commissioned perhaps, by Sir John or even by his flag captain during his time as C-in-C in REVENGE, Captain Gilbert Stephenson?